Agent 47 is once again suited, booted, and ready to wreak expertly sneaky havoc throughout a range of bustling locales in Hitman 2, bringing six new levels which span the globe. Each contains numerous set-pieces to be discovered, and a story with probing insights into 47’s less than idyllic childhood. Io Interactive's latest instalment of Hitman delivers more of the series’ distinctive social stealth sandbox gameplay in some of the biggest levels in franchise history. Let's take a look at the key details. Never plain sailing are they, Hitman plots? With more subterfuge, double-crossing and sleek offices of shadowy cabals than a Bourne movie, they reward attention to detail with stories of global espionage and personal loss at the same time. Hitman 2’s narrative thread is no exception: as 47 and his handler Diana work to uncover the real motivations of the ICA and the Providence group that proved instrumental in Hitman 2016’s events, an opportunity to learn the truth about his past presents itself. Always the high point of a Hitman game, the enormous multi-area locales of Hitman 2 span the world and offer very different assassination methods. Hawke's Bay - set in a single building on a moonlit New Zealand beach, this is Hitman 2’s smallest level but is nonetheless packed with details, secrets, and numerous viable approaches to making your hit. Miami - A race track where your target is currently mid-race, watched by hundreds in the stands. Sounds tricky, but if anyone can pull off a hit in such plain sight it's this guy. Santa Fortuna - a Colombian town in the rainforest, leading off to jungle areas, a series of underground tunnels, cocaine fields and a cartel compound. Quite a bit of ground for 47 to cover then, and three targets to eliminate too. Mumbai - a great showcase for Hitman 2’s NPC onscreen counts, the cramped streets of Mumbai are bustling with market sellers, thugs, civilians, tailors, barbers and plenty else besides. Similar in size to Santa Fortuna, and featuring two targets to eliminate. Whittleton Creek - a slice of American suburbia, complete with a plucked strings soundtrack that summons Desperate Housewives to mind. Two targets are located here. Isle of Sgaig - lashed by the harsh weather of the north Atlantic, this cluster of battered gothic buildings, topped with a glass penthouse is the setting for Hitman 2’s finale. Standard Edition - as you’d expect, this includes the base game, and Sniper Assassin mode. Silver Edition - as above, but with the additional in-game Executive Pack, which includes the ICA 19 Blackballer Pistol and Italian Black Leather Briefcase. Gold Edition - everything included in the Silver Edition, plus Expansion 1, which includes a new location, new missions, an additional Sniper map, extra outfits, and weapons; early access from November 9; and Expansion 2, which also includes a new location, missions, Sniper map, outfits, and weapons. 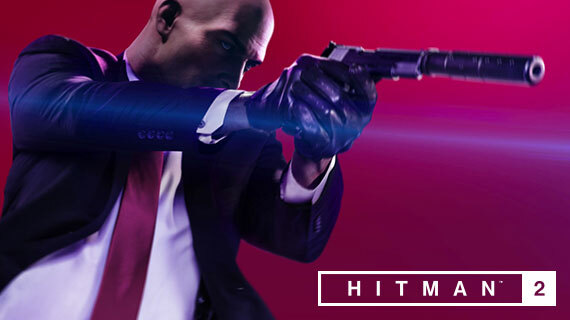 Collector’s Edition - includes everything from the Gold Edition, plus the Collector's Pack, which unlocks the Concussive Rubber Duck and the Midnight Black Suit, as well as a special Gun Case Replica and several physical merch items including the exclusive steel game case, Bullet keyring, Rubber Duck, and the Hitman Coin.